Need a quick, reliable way to size complex federal markets and find new recompete opportunities? Try BGOVMarkets. 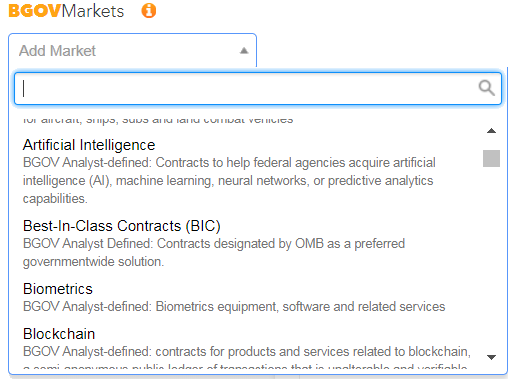 One click of the BGOVMarkets button on BGOV’s Contracts Intelligence Tool provides access to 110 preset market definitions, providing insight into contract vehicles, agency buyers, and incumbents. There’s a BGOVMarket for every broad market category, and fine-tuned markets for the hottest technology, defense, and professional services markets. Examples of BGOVMarkets include artificial intelligence, best-in-class contracts, biometrics, blockchain, and unmanned underwater vehicles. Since the introduction of BGOVMarkets in 2014, Bloomberg Government analysts have been creating market definitions based on client demand. Each BGOVMarket is either custom-created by BGOV analysts, or uses a publicly available definition. BGOV analyst-defined: For the analyst-defined markets — such as cybersecurity, artificial intelligence, and biometrics — our analysts have done their homework. Analysts have created proprietary definitions by mixing keywords with a variety of contract codes. The goal for each market is to show only those transactions, task orders and contracts that are for work in the core of the market, and analysts work hard to exclude false positives. BGOV analysts are constantly revising old markets and creating new markets, as federal government buying patterns change. If you need a market that’s not listed in the PDF attached above, contact your BGOV account manager and we’ll consider adding it. GSA-defined: The classifications rely on the General Services Administration’s Category Management framework. By grouping Product Service Codes, GSA split all federal spending into 19 “levels,” including classifications such as: Information Technology (Level 1); Professional Services (Level 2); and others. Click here for GSA’s category structure. Defense Department-defined: The definitions represent the Pentagon’s government-wide portfolio taxonomy of 27 markets that was created in 2012. Click here for details outlining the DOD’s taxonomy structure and here for details on the Pentagon initiative. BGOVMarkets can be used to provide both tactical and strategic insight. You can leverage BGOVMarkets to generate account plan reports or reports on specific markets. Simply click on a BGOVMarket, and run an account plan report. Clients also rely on BGOVMarkets for sizing and scoping a market to identify essential factors for growing or maintaining their market share. BGOV clients can reach out to their account managers to determine how to customize searches, including BGOVMarkets, to see which contracts and federal agencies customers are essential for growth. If you’re not a BGOV client, and would like to learn more about BGOVMarkets, please request a demo. The post BGOVMarkets: A Simple Way to Refine Your Go-to-Market Strategy appeared first on Bloomberg Government.